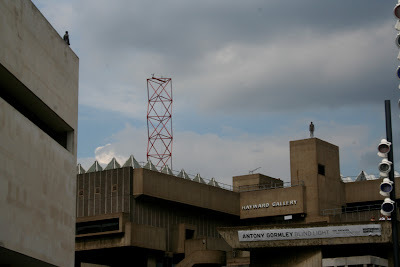 The Antony Gormley show at the Hayward is stunning. Around the gallery within a radius of 2km is an extraordinary spectacle of Gormley figures on rooftops, all facing the gallery - all cast from the form of his body. On top of the Shell Building, across the river beyond Trafalgar Square, behind and beyond in South London, solemn silhouettes impinge on the cityscape. Tens of suicides, or silent witnesses, or reminders of the human form set against solid geometry, or perhaps ghosts from a parallel realm? Inside the gallery there are some fabulous pieces - including a glass room full of dry ice you can enter. Once inside, you lose all sense of space and time, entering an ectoplasmic zone of non-being. One can only think of death, or of birth.